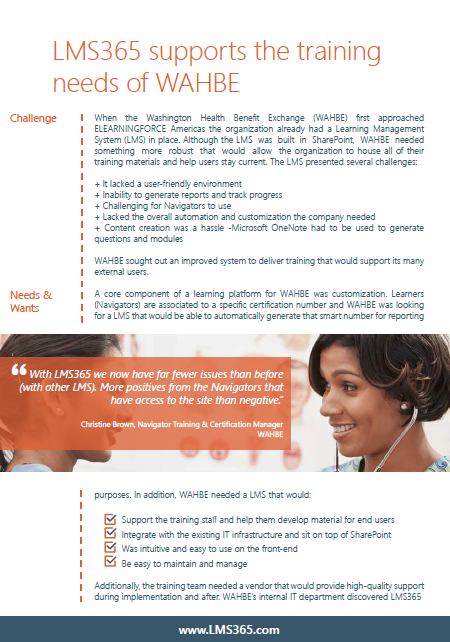 The Washington Health Benefit Exchange (WAHBE) was in need of a more robust learning management system (LMS) that would allow the organization to house all of its training materials and help users stay current. With SharePoint Server in place, the company needed this learning platform to integrate with Microsoft technology. Customization was also a key component: WAHBE was looking for a LMS that would be able to automatically generate a smart number for its users for reporting purposes. After discovering LMS365 at a trade show, WAHBE implemented LMS365 On-Premises in 2014 and was able to do just that. Learn about some of the results the organization has seen.